SpeakerTalk :: View topic - KEF Q50 Tweeter(SP1352) has gone to "KEF Heaven". Excellent, I concur that all appears well. I think you will be in for a pleasant surprise when you fit the new units. Take your time and great care. I'd also have a word with the young lady about future use of your Hi-Fi. The amplifier must have been really clipping at some point. The young lady is permanently barred from touching anything electrical in the house except the kettle. And yes, Im sure the limits of the amp were pushed. Fortunately damage seems limited to the right tweeter, although I suspect the left is teetering on the edge judging by the abuse the right has received so will be replaced too. Been a while I know but the Q50's are not only still working perfectly, they've multiplied. New tweeters installed, sound great. Plus a friend of mine asked me if I'd like another set of tweeters for £40, I said yes. When he arrived the tweeters were still in the speakers, great condition too. He also had another 30B sub. 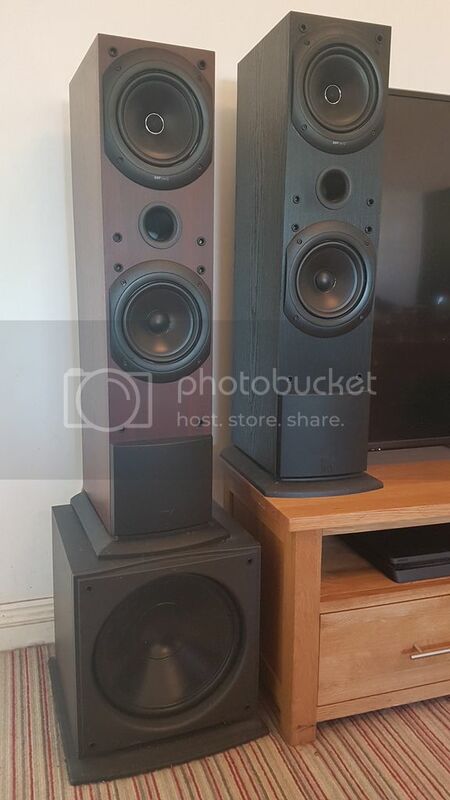 The guy he brought them off had exactly the same setup as myself, a pair of Q50's and a 30B subwoofer. I paid £65 for them all. Have them all in my dining room next to the TV, swap them over occasionally, to keep the cobwebs away .. Excellent news, some people have all the good luck, well done!